Thank you for your interest in Chiropractic Health Advantage. Our very experienced chiropractic staff strives to provide the highest standard of professional care in a friendly, comfortable environment. We hope that the information provided here answers many of your questions about chiropractic care. If you would like additional information, please don't hesitate to contacts us at (231) 876-1720 or click here to email. We will respond promptly. You can achieve improved health for your body now and in the future beginning with a simple anatomical concept. The nervous system (the brain and all the nerves) controls every function of your body. If this network is interfered with, pain can ensue, as does bodily malfunction, often resulting in sickness and diminished overall health. The "something" you can do to improve performance and your health is to maximize the health of your nervous system. There are several ways to do this. The number one way is allowing a Doctor of Chiropractic using the ProAdjuster equipment to analyze and treat your body. To better understand, let's examine the idea of palpation. When a Chiropractor palpates your spine, they are checking for joint fluidity, motion and or rigidity. Improper motion affecting the nerve function is called a subluxation. In a similar fashion to palpation, the ProAdjuster can help determine whether the vertebra's motion is too rigid or too fluid. The spine should not be too rigid (hypomobile). However, instead of utilizing the doctor's judgment as to what areas are hyper-mobile or hypo-mobile, the ProAdjuster measures precise levels of motion. Therefore, the ProAdjuster can help isolate a problem area faster and more accurately than manual procedures. 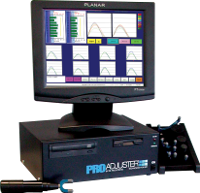 The ProAdjuster utilizes a precise oscillating force with uninterrupted motion. It is able to increase the mobility of the spinal segments by reducing fixation or enabling motion in the abnormal areas. In other words, the ProAdjuster is "unsticking" the joint. Have you ever seen a woodpecker tapping in an oscillating fashion on a tree? It is hard to believe, but you can watch them bore right through the hardest wood! The ProAdjuster taps in much the same way but uses soft tips that are comfortable to the human body and result in a nice change to the health of a joint or tissue. Need directions to our office? Please visit our interactive map here. Site designed by Scott Merryfield.